Jůza and Burkhart, with new addition Baeckstrom, get their revenge on Peach Garden Oath! 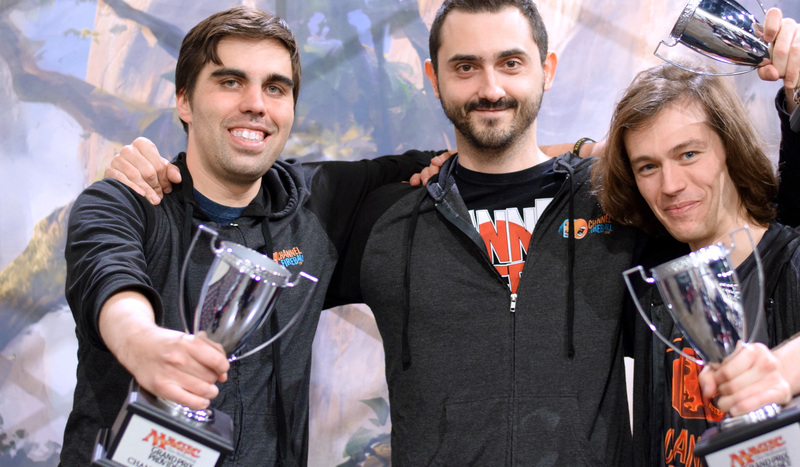 More than 550 teams and 1600 players made their way to the Rhode Island Convention Center in Providence this weekend, eager for an early look at the Ixalan Limited format and a shot at claiming the Grand Prix title. On Day 2, 127 teams returned to build three new decks from fresh boosters and play another four rounds on their way to the Top 4. From a field full of pro players and team event all-stars, a final four emerged. In the semifinals, Turtenwald, Jensen, and Duke quickly dispatched Li, Yao, and Ling. A few feet away, Andrew Baeckstrom, Martin Jůza, and Corey Burkhart did the same, taking down Grand Prix first-timers Will Sullivan, John Twardowski, and Cody DelPazzo. That set up a near-exact rematch of the finals of Grand Prix Cleveland a few months ago, where Turtenwald, Jensen, and Duke beat Burkhart and Jůza, along with third Shuhei Nakamura, for the title. But this time, Baeckstrom, Jůza, and Burkhart got their revenge, with Baeckstrom and Jůza claiming decisive 2-0 victories. Congratulation to Grand Prix Providence 2017 Champions, Andrew Baeckstrom, Martin Jůza, and Corey Burkhart! It's a thrilling weekend in Providence,RI, as the release of Ixalan and a much-anticipated Team Limited Grand Prix coincide, bringing together players from around the world eager to explore aworld full of Vampires, Merfolk, Dinosaurs, and more. Over 550 teams competed on day 1. At the end of Round 9, only one team remained undefeated. William and David Pargh, brothers who drove here in an RV from Ithaca, NY, along with their teammate, Connor Robinson, defeated a gauntlet of tough opponents, some with multiple PT and GP Top 8s, to go 9-0. Tomorrow, all teams with at least 18 match points, or a record of 6-3 or better, will return to build three new decks with fresh boosters. Over the six remaining rounds, they'll fight for a coveted spot in the Grand Prix Providence Top 4 and a seat at the team draft table. Join us tomorrow at twitch.tv/magic to see the exciting conclusion of GP Providence!